I’m into berries and all kinds of berries at that. I’m not sure what it is about them, but they make me feel like I’m feeding my body with great nutrients. Maybe it’s all the marketing talk you hear about berries helping with anti-aging, alzheimer, being brain food…etc. And while I could sit and eat fruit all day, sometimes you just have to chug and go, and that’s when smoothies come in handy. I don’t usually make smoothies that often (once a week) because I just hate the cleanup. Mentally it’s a struggle for me to prep all the fruit too and I’ve always been this way. I salute the crazy smoothie heads on IG that are killin it every day with awesome pics! So, without wasting my time to spend on something that I just drink in 2 minutes anyway, you will always finding me make a smoothie with vanilla ice cream to make it count. One could say this is more like a milkshake, but I don’t really know where to draw the line between the two anymore, and it doesn’t really matter, so as long as this drink is something special. I use a combo of raspberry, strawberry and banana. Banana is a must because it will always balance out the tartness from the berries. I also use ice cubes to make sure the smoothie is extra cold (you could use frozen fruit too, but i prefer fresh) and a big spoonful of Flax seed to get my omega-3 ‘s in. To finish, I shaved some Cacao chocolate and topped it off with coconut shavings too! This is a pretty simple smoothie without any tricks or gimmicks and that’s why I love it so much. A drink that sits in between a smoothie and a milkshake is called what? 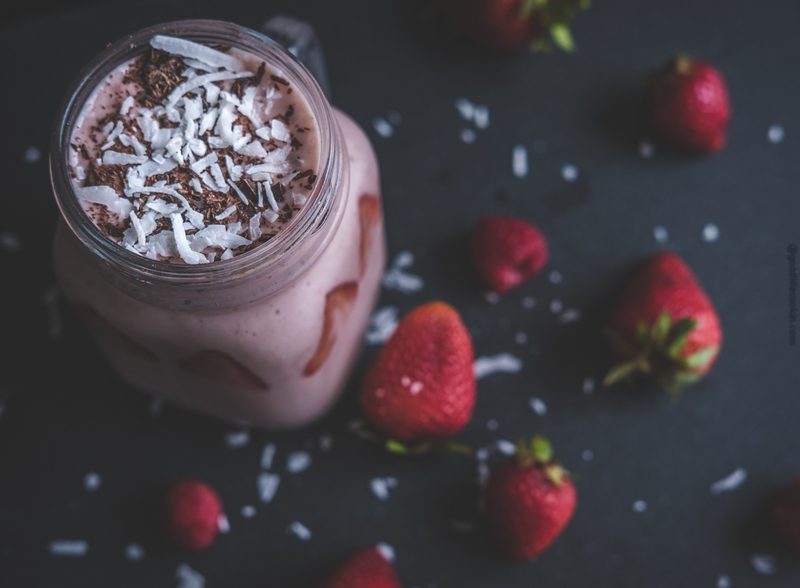 Here's a strawberry smoothie that 100% plant based and sweet for the soul. Wash raspberry and strawberries and remove stems. Great idea with the flax for the omega-3..yummy! Yep! I try to add flax or hemp seed to a dish every chance I get!